Cover image: Detail from The Transfiguration, by Carl Heinrich Bloch. The Catholics believe that the pope holds in succession the keys Jesus gave the apostle Peter. The keys are considered the symbol of the pope’s power to govern the church. St. Peter’s was built at a time when the authority of the pope was being questioned by reformers such as Martin Luther, so the huge inscription from Matthew 16:18-19 was intended to re-assert that authority. The question of who holds the keys to govern the church of Jesus Christ has always been vitally important. Some Christians believe the pope holds the keys. Others believe the keys were handed down to all the bishops of the Christian world. Still others believe the keys given to Peter and the apostles have nothing to do with governing the church. So what do the keys given to Peter represent? Are they important or not? Are the keys relevant to followers of Christ today? “And Jesus answered and said unto him, Blessed art thou, Simon Bar-jona: for flesh and blood hath not revealed it unto thee, but my Father which is in heaven. And I say also unto thee, That thou art Peter, and upon this rock I will build my church; and the gates of hell shall not prevail against it. “And I will give unto thee the keys of the kingdom of heaven: and whatsoever thou shalt bind on earth shall be bound in heaven: and whatsoever thou shalt loose on earth shall be loosed in heaven” (Matt. 16:16-19). “The gates of hell shall not prevail against it.” Against what? The church, of course, and those who hold the keys. This passage has usually been interpreted that hell will not prevail over the church, but there is another way to read it. If, as is often said in the scripture, that hell is a prison, what is the key for? To open it! Thus one purpose of the keys of the kingdom is to open up the prison house of the dead to the church and permit the prisoners in the unseen world of spirits to hear the gospel and join the church of Christ. The true church will use those keys to perform works of salvation for the dead. Second, the apostles can use the keys to “bind” on earth and in heaven. The original New Testament Greek word “to bind” is deo, which literally means to bind or tie things together. Today, the true church of Christ uses the keys to bind or “seal” families together for time and eternity. Additionally, the apostles use the “keys of the kingdom” to build up and administer the church of Christ. Anciently, the steward of a great house was given the keys as the tools of his calling, but the keys also symbolized his authority to stand in proxy for his master. The apostles are like those stewards. They exercise the keys of authority as the representatives of Jesus Christ on the earth. President Dallin H. Oaks explains. “‘Priesthood keys are the authority God has given to priesthood [holders] to direct, control, and govern the use of His priesthood on earth. Every act or ordinance performed in the Church is done under the direct or indirect authorization of one holding the keys for that function” (“The Keys and Authority of the Priesthood,” Ensign, May 2014, 49). The keys that Peter held along with the other apostles (see Matt. 18:8) enabled them to conduct the affairs of the church everywhere. Peter used the keys many times, most notably when he “opened the door of faith unto the Gentiles” (see Acts 14:27; 15:7). About a week after this interchange between the Lord and the apostles, He invited Peter, James, and John to accompany him up a high mountain “apart by themselves.” There he taught them about His Atonement and the significance of what He was about to go through. However, they fell asleep and when they woke up, “Jesus was transfigured before them. And his raiment became shining, exceeding white as snow; so as no fuller on earth can white them. And there appeared unto them Elias with Moses: and they were talking with Jesus” (Luke 9: 31; Matt. 17:1-4). At this appearance, known as the Transfiguration, the apostles were “sore afraid” and “wist not what to say.” The three apostles apparently did not yet understand what was happening, and much of what did happen is not revealed in the New Testament accounts. The apostles were themselves transfigured as well. Transfiguration is “the condition of persons who are temporarily changed in appearance and nature—that is, lifted to a higher spiritual level—so that they can endure the presence and glory of heavenly beings” (Guide to the Scriptures, “Transfiguration”). 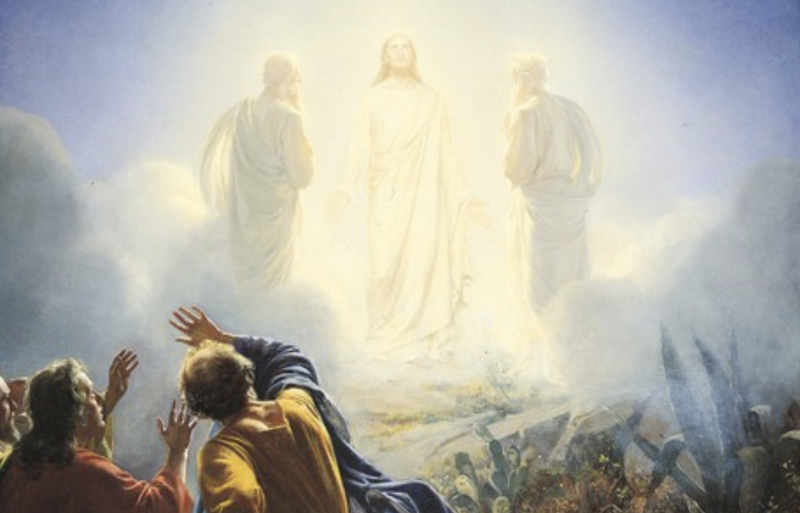 The Transfiguration had to do with the transmission of keys and ordinances to Peter, James, and John, who would go on to function as a First Presidency of the Church. According to the Prophet Joseph Smith, “The Savior, Moses, and Elias [Elijah], gave the keys [of the priesthood] to Peter, James, and John, on the mount, when they were transfigured before him” (Teachings of Presidents of the Church: Joseph Smith , 105). Additionally, Peter, James, and John restored the keys of the apostleship to Joseph and Oliver in June 1829. In each dispensation, God confers priesthood keys upon His chosen servants so they can direct His work upon the earth. Keys were given to dispensational prophets such as Adam, Enoch, Abraham, and Moses after periods of apostasy. The same heavenly messengers appeared in the Kirtland Temple on April 3, 1836, to restore priesthood keys to the Prophet Joseph and Oliver Cowdery: Jesus Christ introduced Moses, who restored the keys of the gathering of Israel, and Elijah restored the keys associated with the sealing power (see D&C 110:11, 13-16). These appearances in Kirtland provide a pattern for understanding what took place on the Mount of Transfiguration. Furthermore, “it appears that Peter, James, and John received their own endowments while on the mountain” (Joseph Fielding Smith, Doctrines of Salvation, [1954–56], vol. 2, p. 165). They were privileged to see in vision the entire scope of the Lord’s plan right up to the end, when “the earth shall be transfigured, even according to the pattern which was shown unto mine apostles upon the mount; of which account the fulness ye have not yet received” (D&C 63:20-21). The three apostles received the fulness of the ordinances of exaltation and were introduced into the presence of the Lord: “And there was a cloud that overshadowed them: and a voice came out of the cloud, saying, This is my beloved Son: hear him” (Matt. 17:7). We do not have a “fulness” of the account of the Transfiguration, but Peter was so impressed by the experience that he proposed constructing tabernacles on the mount. “Master, it is good for us to be here: and let us make three tabernacles; one for thee, and one for Moses, and one for Elias [Elijah].” At that time, the Jews were accustomed to pitching their tents, or tabernacles, around the temple of Jerusalem at the Feast of the Tabernacles in order to participate in worship and to hear preaching from the temple. We don’t know if the Transfiguration took place at the time of this feast, but it seems logical that Peter would associate in his mind the custom of tabernacles in order to hear more from the holy prophets (Matt: 17:8). But the holy ceremony was over. “Suddenly, when they had looked round about, they saw no man any more, save Jesus only with themselves.” As they went down the mountain, Jesus charged them to “tell the vision to no man” (Matt. 17:9). So “they kept it close, and told no man in those days any of those things which they had seen” (Luke 9:36). What had happened was most sacred and confidential. Latter-day Saints must understand the significance of the transmittal of priesthood keys and the Transfiguration. Elder David A. Bednar has said, “I invite each of you to consider how you would respond to the following question. . . . If at this moment each one of you were asked to state in one sentence or phrase the most distinguishing feature of The Church of Jesus Christ of Latter-day Saints, what would be your answer? “[The answer]: The divine authority of the priesthood. The Church of Jesus Christ of Latter-day Saints stands apart from other churches that claim their authority is derived from historical succession, the scriptures, or theological training. We make the distinctive declaration that priesthood authority has been conferred by the laying on of hands directly from heavenly messengers to the Prophet Joseph Smith” (“The Powers of Heaven,” Ensign, May 2012, 48). So what do the keys of the priesthood mean to us today? The Prophet Joseph said, “The great and grand secret of the . . . whole subject that is lying before us, consists in obtaining the powers of the Holy Priesthood. For him to whom these keys are given there is no difficulty in obtaining a knowledge of facts in relation to the salvation of the children of men, both as well for the dead as for the living” (D&C 128:11). Therefore, the keys are among the greatest blessings the Lord has given us. The keys distinguish the Church from all others. The keys permit priesthood holders to perform the ordinances of salvation and exaltation. Without the keys no ordinances such as baptisms and sealings could be done. Our families could not be sealed together for eternity. We would not know whom to turn to for the word of the Lord because no one would have the keys to open the heavens and receive revelations. When we honor and respect apostles, stake and quorum presidents, and bishops, we are honoring and respecting the keys they hold in direct succession from the Savior Himself.